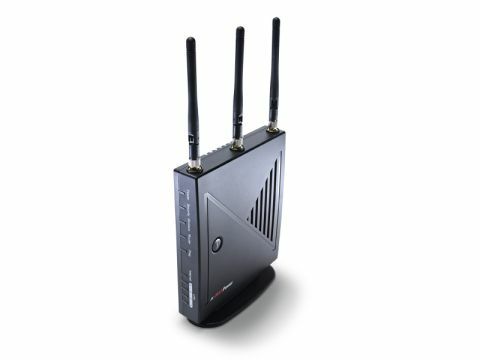 Let's start by saying that this MAXPower Wireless Router is a fine piece of kit. The web interface is, if not the best we've seen, finer than the majority of interfaces proffered by independent router manufacturers. Setup is entirely straightforward, and the multicolour LEDs mean you can get a handle on potential problems before even connecting. Hooking up to an Ethernet-based modem is easy, although you're somewhat stuck if you're using a USB-based ADSL modem since the MaxPower router lacks the USB ports that are becoming common on today's more advanced devices. If your ISP is forcing you to use a combined modem-router, there's also an external switch that enables you to use this as an access point, effectively upgrading your existing kit to wireless n standards. But who needs expandability if all you're after is speed? Upgrading from a standard wireless g router, using the built-in AirPort card of a first-gen 17-inch Intel iMac shaved a little time from our average packet round-trip (from 2.6ms down to 2.0ms), making this a viable upgrade even if you're not intending to jump to n just yet. Adding the Max Power USB stick dropped the average to 1.4ms, which is extremely impressive. In real terms, the time taken to copy a 700MB file to an Ethernet-connected Windows share dropped by a good three minutes – if you're sick of the sluggishness of wireless data transfer, wireless n really is a breath of fresh air. It won't magically increase the speed of your internet connection, though. It's great for range, as well; using this and its associated USB stick, we got an average of around 93% signal strength even through a floor and two solid walls, a spot where our AirPort card manages only three bars. This is a variable which depends on the kit being used, however – switching back to our built-in AirPort card caused the signal strength to drop significantly. You really need wireless n kit on both ends to benefit from the standard most.